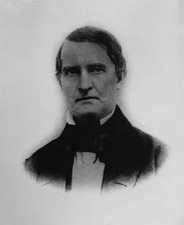 CHAMBERS, Henry H., a Senator from Alabama; born near Kenbridge, Lunenburg County, Va., October 1, 1790; graduated from William and Mary College, Williamsburg, Va., in 1808, and from the medical department of the University of Pennsylvania at Philadelphia in 1811; moved to Madison, Ala., in 1812 and engaged in the practice of medicine; served in the Indian wars as a surgeon; returned to Alabama and settled in Huntsville; member of the State constitutional convention in 1819; member, State house of representatives 1820; unsuccessful candidate for Governor in 1821 and 1823; elected to the United States Senate and served from March 4, 1825, until his death near Kenbridge, Lunenburg County, Va., January 24, 1826, while en route to Washington, D.C.; interment in the family burial ground near Kenbridge, Va.
Watson, Elbert L. "Henry H. Chambers." In Alabama United States Senators, pp. 25-26. Huntsville, AL: Strode Publishers, 1982.